Everyone has a background and so does Jackie. He is an orphan from the slums of Mumbai raised by the city itself. Just like every Mumbaiwala, he had big dreams. He wanted to rule the city some day. But just like most of them his dreams never materialised. But his actions drove him that much farther from his dream. 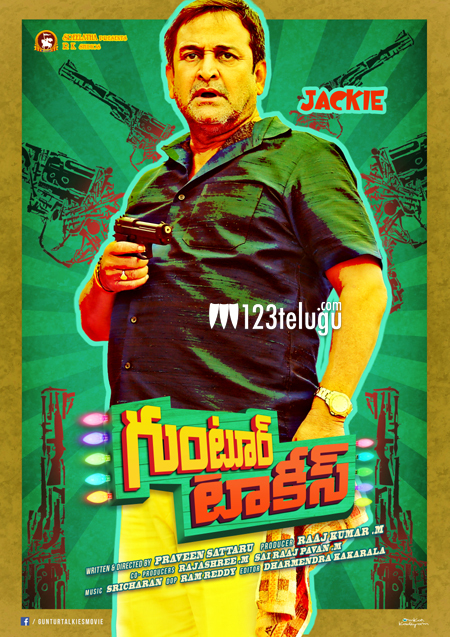 Jackie is a refugee from the Mumbai under world who is genuinely trying to make a living in a not-so-genuine business on a foreign land, Guntur. Undoubtedly there is no match to Mahesh Manjrekar for a character like this. He poured soul in to the character and brought it to life. For the first time, he gave voice to a Telugu Film and he’s done it in style. As an actor from Theatre, a director and having been served as a Member of Parliament, his commitment and dedication towards film making is unparalleled and unmatched. Siddhu, Rashmi Gautam, Shraddha Das, Naresh Vijaya Krishna, Raghu Babu, Thagubothu Ramesh, Raja Ravindra, Snigdha, Ravi Prakash, Fish Venkat, Jogi Naidu, Allari Subhashini, Karate Kalyani, Krishneswara Rao, Gundu Sudharshan, Jayavani.